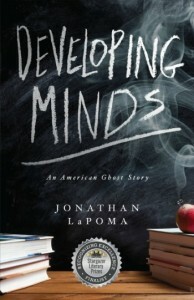 The following is a guest post by Jonathan LaPoma, author of Developing Minds: An American Ghost Story. If you would like to write a guest post on my blog, please send me an e-mail at contact@cecilesune.com. So, what is Developing Minds: An American Ghost Story about? Developing Minds is an award-winning literary fiction novel that follows a group of recent college graduates who struggle with feelings of alienation and their addictions as they try to survive a year of teaching at two dysfunctional Miami public schools. Developing Minds is equal parts dark and humorous, and offers readers a brutally honest look at the American public school system and the extreme measures many teachers take to cope with working in it. Kirkus Reviews gave it Recommended Review status and called it an “Entertaining and authentic look at the troubled American education system,” the San Francisco Book Review called it “Incredibly artistic,” and the Stargazer Literary Prizes awarded it as a finalist in their 2015 Visionary and Metaphysical Fiction category. The story can be vulgar and quite graphic in places in regards to drug use, fighting, and sexual situations, but overall it’s a story with an important theme, that through compassion and self-understanding people can overcome their suffering and develop on personal, professional, and creative levels. I see it as a mix between Post Office by Charles Bukowski and Teacher Man by Frank McCourt. Why did you write Developing Minds? In part, I wanted to take readers on an inside look in a typical at-risk school in this country. I wanted to show the good as well as the bad, and do so in an honest and thoughtful manner without making judgments or pushing an agenda. A reviewer from the Midwest Book Review mentioned liking my focus on the details—the smaller moments in the day-to-day which bring a humanizing and “real” feel to the story. This isn’t some “outsider-comes-in-and-saves-the-dangerous-children” kind of story. It’s your aunt’s story, or your cousin’s story, or your next-door neighbor’s story. But I also wanted to tell the story of how a young writer, tormented by his own dark past, learns how to make peace with this past through his interactions with his troubled, but caring, students. As he begins to relate with the neglect and abuse his students feel, this main character starts to understand and distance himself from some of the shame he felt as a kid, and he’s able to overcome his writer’s block as a result. I see Developing Minds as more a coming-of-age story that happens to be set in a school than it is a story about teachers learning how to be better at their job. The main character wants to write, not teach, and his arc follows this trajectory. Most people already know that some of America’s public schools can be dysfunctional and dangerous. Will they learn anything new after reading your book? I know that most people are aware that some of our nation’s public schools can be dysfunctional and dangerous, but I’ve found that this awareness is limited or distorted by cartoonish books and films they’ve seen that either exaggerate the violence and/or teacher/student interactions, or that romanticize the struggles in the classroom, leading people to have a false idea of what’s really going on in America’s public schools. I think Developing Minds provides an honest look at what’s going on behind closed doors without slipping into this kind of harmful distortion. What challenges did you face as a first-year teacher? My first year of teaching was also my first “real” job after college, so I not only had to learn how to survive as the leader of a classroom, but also how to survive living on my own. Survival was the key word. During that year, I experienced overwhelming feelings of isolation, due to the lack of support from administrators, parents, community members, other teachers… and also due to the everyday emotional stressors of the job. I found that the courage and energy and drive to keep going often must be one generated from within. It was a great challenge for me to look inward and find that drive. What advice do you have for first-year teachers? Find the humanity. One of the most difficult aspects of teaching is dealing with behavior issues. Kids will find your buttons and they’ll push the hell out of them. If you can detach yourself from those moments emotionally, you can begin to understand why they affect you so much, and in time, you’ll get better at dealing with the hurt feelings. In time, you’ll find the mature and responsible ways of dealing with difficult situations. I think this is one of the most difficult things for teachers to learn, and I think this is why so many new teachers end up quitting before their first year is over. Even if you do “find the humanity,” the kids will still get under your skin. They’ll still find myriad ways to frustrate you. But at least, if you’re operating under a place of growth, you’ll find better ways of dealing with their negative behavior. Does the book offer any specific solutions to problems in America’s public schools? Not really. The book discusses some general ways individuals can cope with working in a dysfunctional system, but it doesn’t offer any specific strategies. Again, my intention here wasn’t to “save the day”—I simply wanted to take the reader inside of a dysfunctional school and show how this dysfunction affected the main character, who was inspired by his experiences there to take steps away from his own mental disease and find a more positive life path. The focus is on this journey, not the school’s. Do you think that self-understanding and growth can lead to positive change both inside and out of America’s schools? I do. I believe that, when people are able to recognize and understand the suffering in their own lives, they’re better able to cope with it, and thus, can affect more positive changes in the world around them. I believe that a revolution from within rather than simply from without can lead to sincere and lasting change in our society. I understand that Developing Minds is the second installment in a loosely-based trilogy. Can you tell us a little about your first book and how it relates to Developing Minds? My first book, Understanding the Alacran, chronicles my experiences living in a small Mexican town for about five months after graduating college. That first year after graduating was one of the most difficult of my life. I’ve dealt with depression and anxiety for as long as I can remember, but they overwhelmed me at that particular time in a way I hadn’t yet felt. But there was something about Mexico that gave me a purpose and helped me through those dark days, and when I returned to the U.S., I knew that I wanted to share these experiences with others. Both books can be read and understood separately from one another, like Kerouac’s Duluoz Legend series, but by reading the first book, people will have a better idea of the abuse Luke faced as a kid and have some more of the specifics of what he was running from. I think people will have a much more well-rounded idea of the character, and the ending of Developing Minds will have a stronger effect. There isn’t much written about Luke’s past in Developing Minds, and Understanding the Alacran, will give a much more in-depth study of the character. I haven’t yet tried to publish Understanding the Alacran, but would like to do this sometime in the next few months. About the author and his work: Jonathan LaPoma’s Website. 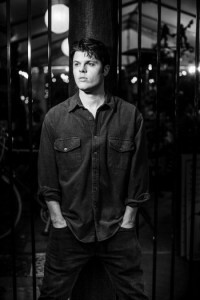 Jonathan LaPoma is an award-winning novelist, screenwriter, songwriter, and poet from Buffalo, NY. His work often explores themes of alienation and misery as human constructions that can be overcome through self-understanding and the acceptance of suffering. He lives in San Diego, CA.